Superman. Batman. Wonder Woman. Spider-man. Have you ever dreamed of being a hero for someone? Webster’s Dictionary defines a hero as: A person of distinguished valor or enterprise in danger, or fortitude in suffering; a prominent or central personage in any remarkable action or event; hence, a great or illustrious person. A hero is also described as someone regarded as a model or ideal, or someone who fights for a cause. 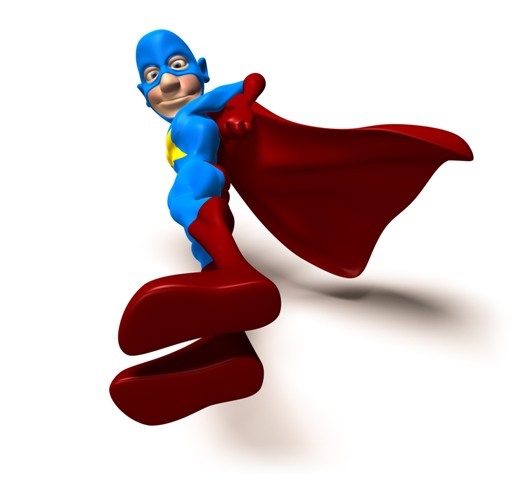 Being a leader today provides us with many opportunities to be a hero. There are enemies and suffering in this world of all types; there are battles to fight, needs to meet, people who hurt… God has called us to make a difference in this world and there is so much to do. COMPASSION – God has given us the ability to care deeply about people and situations. I get a an aching pit in my stomach or energetically pound the table because I feel strongly about something… What is it that causes you to want to DO something? …lost souls, abused children, human trafficking, orphans and widows, injustice, pollution, teamwork? Think about it… consider it… it doesn’t matter what it is, but if God has put the passion in your heart, I have learned that He will also give you the opportunity to get involved, and you can be a hero to someone (or many!) in that area. ATTITUDE – Phil Collins describes a “level 5” leader, one who will leave a legacy, as one who has the right combination of humble modesty and confident will and resolve. Our world needs more people who are willing to give, to serve, and to go… and who can work hard and hang in there to get the results needed. Most superheros didn’t go looking for their job; some tried desperately to avoid the responsibility… but eventually yielded their own desire for a quiet life of anonymity to meet the needs of others. I want to be the kind of leader who does not “lord-it-over” others, but who is strong in character and willing to persevere to get the job done. I want to honestly evaluate any growth area that might get in my way. How about you? POWER – All superheros have a special source of power… and so do we! God has promised that when He calls us to something, He will also enable us with all that we need. We have His Word; we have His Spirit; we have an amazing variety of resources in His people. We have no excuse! The trick is relying on His power and not my own, working together with His people and not alone. I remember that the hero usually gets in trouble when he forgets to use his special power – I need to remember who is in charge. ETERNAL PERSPECTIVE – Superheros take on the enemy and trans-form their world. Nothing is too big, too scary, or too hard for them. They know that people are “worth it” and that people can make a difference. We are created for a purpose; when we let God work through us – even in seemingly small ways – we can make an eternal impact in someone else. I want to see challenges from God’s perspective and remember that He put me here for a reason. I think there are too many negative role models in our world today and too many huge needs for any of us to sit on our thumbs and not get involved in the supernatural adventure of being a “hero”. What do you think? Do you want to be a hero with me?